It's as hard as a fiberglass cast, but look how much of your skin is exposed! If you made a list of things that sucked about breaking your arm, the fiberglass cast to heal you would be close to the top. You can't shower with it, you can't get at your skin and you wind up an itchy, sweaty mess for months on end. 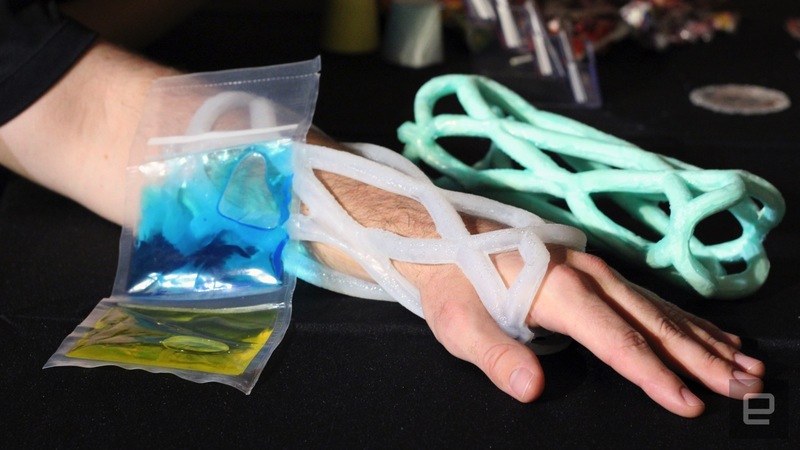 Three college students out of Illinois believe that they can alleviate some of those bugbears with Cast21, a pretzel-esque sleeve that would replace traditional fiberglass castings. The Cast21 sleeve is a mathematically-designed structure that's as rigid as a traditional cast, but without most of those issues. For instance, its hollow design means that you can get to most of your skin, letting you scratch those itches when you need to. Plus, you can get it wet, it's lightweight and can be removed with a pair of pointed shears. Oh, and it'll cost roughly the same as the existing procedure, so it won't put too much of a dent in your hospital bills. The sleeve itself is made of silicone and comprised of a series of hollow tubes that are all connected together. Once a doctor places it on your forearm, two liquids are injected into the tubes and as they mix, the structure hardens. The silicone construction means that a wide variety of colors and designs can be incorporated into the cast, including block colors, camouflage pattern and even a "cookies and cream" motif. The team behind Cast21 are currently looking for investors to help them get through the initial manufacturing and prototype stages. Should that cash arrive soon, it's hoped that initial trials on human patients could begin as early as mid-2017, although that's a very ambitious goal. COO Justin Brooks also has one eye on conquering the animal market, given how frequently you see dogs with broken forelegs. He also says that his company has one up on its 3D-printed rivals since there's significantly less complexity with stretchy silicone.